Webinar channel for the latest in everything digital performance. The latest industry knowledge from SOASTA on digital performance management, web performance, data analytics, and leveraging end-user experience for success. Digital disruption is creating opportunities and very real challenges for businesses large and small. Industry leaders understand that connecting with customers through the best digital experiences is key to competing in today’s marketplace. And laying the foundations for how those connections will evolve is even more critical to creating opportunities tomorrow. 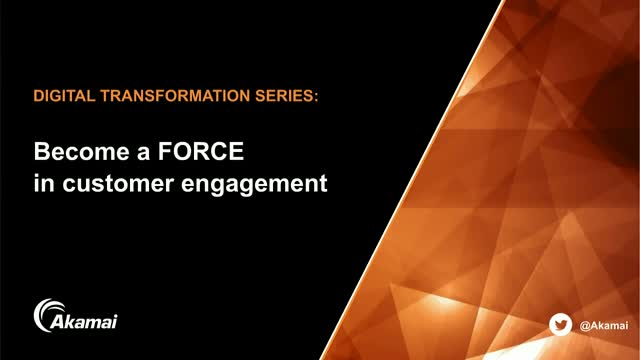 Hear from Akamai about the disruptive trends and digital innovations that will make you a customer engagement Jedi master. In the developer world, measurement of code and infrastructure has long served as the “eyes” into system quality and performance. But, as our systems become more focused on microservices and “serverless” function-centric models, the paradigm of measuring the system by its code breaks down. The solution seems to come from looking at things from the user’s perspective and measuring and testing user outcomes. Find out how this shift is changing everything from monitoring to testing to system design. End-to-end website optimization is a challenging goal for any retailer. With code changes, new features, new platforms, third party integrations, performance testing, and the clock ticking, full site optimization can be a tall order. From back-end infrastructure to front-end resources, join us as we take a look back at Nordstrom’s holiday preparation for some insight. Also, we’ll take a look into the future of performance analytics with SOASTA’s data science capabilities already helping over half of the IR 100 stay competitive. Join Mat Ball, Product Marketing Manager at SOASTA, for this tips-filled webinar. Mat will share how Nordstrom and other like retailers prepare for holiday readiness using performance optimization and analytic tools to assess, track, and improve their site’s performance. This web seminar will explain how to customize performance practices by measuring the impact of your end-to-end website optimization and how to utilize data science techniques to drive your business outcome. If you're not squeezing the most value out of your campaigns, you definitely have a competitor who is. Amazon continues to increase its online retail market share, and retailers are realizing they need to up their efforts to compete. For many retailers, part of these efforts includes stepping up their number of online promotions. But with dozens – or even hundreds – of promotions per week, it’s dangerously easy to lose touch with how campaigns are performing. Ecommerce businesses that aren’t optimizing the speed and performance of their online promotions are leaving large sums of money on the table. Analyzing the billions of collected customer experience data from top internet retailers tells us this is not the exception – it’s the norm. So how can your company maximize returns from your marketing campaigns? Join Mat Ball and SOASTA Chairman and Founder, Ken Gardner to see how top internet retailers – such as Gap, Neiman Marcus, and Lowe’s – maximize revenue and conversion outcomes for their promotional campaigns. Join Mat Ball and Iris Lieuw for a tech talk on how SOASTA data science can give your company a competitive advantage in your market. Mobile web and app usage is growing at a breakneck pace! Between 2014 and 2015, traffic from mobile devices increased from 40% to 75% of total retail traffic, an increase of 35%. In 2015, mobile commerce accounted for $115 billion worldwide. At the end of this year, that number is projected to reach $142 billion. Whether your peak time is Black Friday and Cyber Monday, monthly filing rush, quarterly reporting, annual open enrollment, tax filing, or any other peak, this webinar will give you the steps to build load tests so your mobile site and apps will be ready for mobile peak. In the ongoing push in ecommerce digital transformation, promotions are more critical than ever. How can your company maximize returns from your marketing campaigns? Ecommerce businesses that aren’t optimizing the speed and performance of their online promotions are leaving large sums of money on the table. Analyzing the billions of collected customer experience data from top internet retailers tells us this is not the exception – it’s the norm. Join Mat Ball and SOASTA Chairman and Founder, Ken Gardner, as they showcase how SOASTA helps top internet retailers – such as Gap, Neiman Marcus, and Lowes – maximize revenue and conversion outcomes for their promotional campaigns. Your takeaway from the webinar will be a more complete understanding of common challenges with marketing promotions, tips and best practices from ecommerce companies that use data science as part of their everyday business, and steps you can take to maximize revenue and conversions from your marketing promotions.